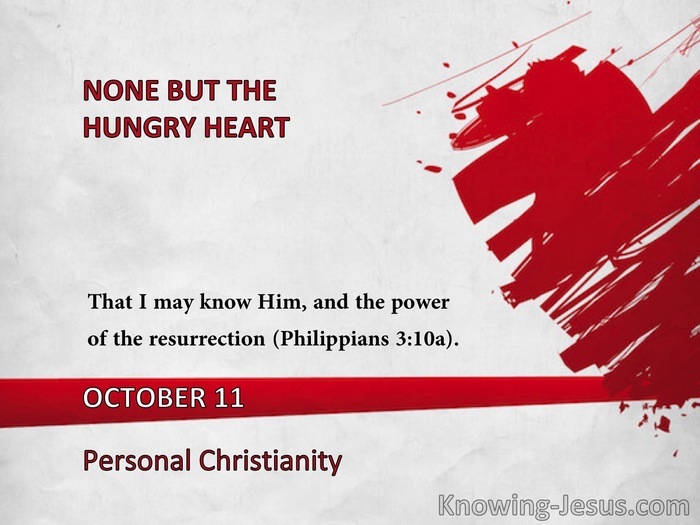 That I may know Him, and the power of the resurrection (Philippians 3:10a). Fellowship with the written Word is the foundation, and fellowship with the living Word is the superstructure, for spiritual growth. "While Martha was cumbered about much serving, and her love, most true in its way, went forth in actively providing for the Lord's outward need, Mary, unconsciously perhaps, proved her stronger faith and deeper love by sitting at His feet and drinking in His words. The thought of Martha's heart was, What a feast I must give the Messiah, when I receive Him at my home! "Mary, on the contrary, felt that the best feast for Him, and for herself, was to receive and treasure up all she could from Him - to see, and hear, and be with Him. If we are learning thus from the Lord Jesus, we honor and please Him incomparably more than by anything we think to confer upon Him. In the long run, too, it is the listening at His feet which best fits for the most acceptable worship and service." -J.N.D. "We should ever remember that Christianity is not a set of opinions, a system of dogmas, or a number of views; it is pre-eminently a living reality - a personal, practical, powerful thing, telling itself out in all the scenes and circumstances of daily life, shedding its hallowed influence over the entire character and course, and imparting its heavenly tone to every relationship which one may be called of God to fill. "In a word, it is that which flows from being associated and occupied with the Lord Jesus. This is Christianity. There may be clear views, correct notions, sound principles, without any fellowship with the Lord Jesus in glory; but an orthodox creed without communion with Him will prove to be a cold and barren thing." -C.H.M. 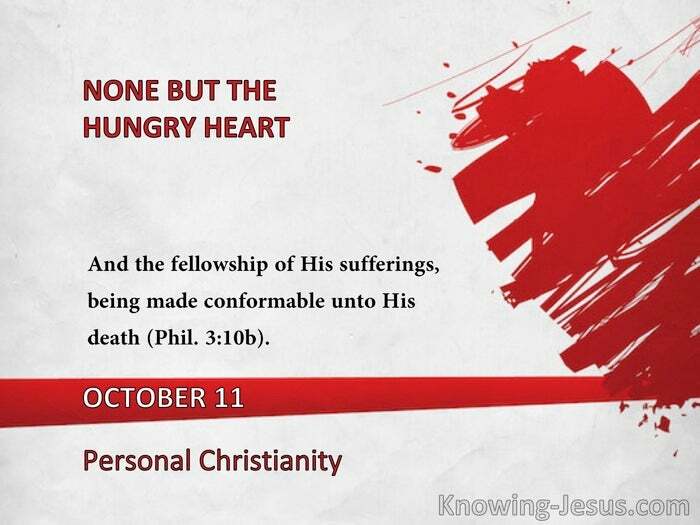 "And the fellowship of His sufferings, being made conformable unto His death" (Phil. 3:10b).